before shot showing position of sun. Simple solution to eliminate mowing in an awkward area with a lack of sun. Many of the biggest landscaping blunders come from a lack of landscaping planning. This is one of the reasons why we have a dedicated section in all our how-to modules about “The Site”. Even some of the most experienced landscapers can relate a story of how failing to plan cost them dearly. When we plan or design in landscaping, we often have a narrow scope or vision. We tend to focus on the features we want to install, and have our blinders on for everything that can affect them. We try to have homeowners thinking about everything they can before they start a job, no matter how big or small it may be. I have seen some huge mistakes on some pretty small jobs. Some mistakes that have cost more than the job was worth in the first place. So what's my “trick of the trade” here? It's how I think when planning. I always think of these three words. Up, down, and underground. Take lots of pictures before you start designing and record the times the pictures were taken. Remember the three words when you review the pictures at the table. The pictures you take will give you the “Big Picture”, so you are aware of everything up above, and down on the ground. You will have to call your local utility companies for things that are underground. Up above - The sun, trees, overhead lines, rooftops, and downspouts will all impact your project in some way or another. Shade from a big tree may affect your garden and lawn designs. Bringing in equipment to work in your yard might be affected by overhead lines. Planning for drainage from a downspout in a heavy rain is also something you will have to consider. Down on the ground - Grades, slopes, berms, swales, and soil conditions. These should be easier to deal with as they are always in our view, but proper grading is still one of the biggest mistakes people seem to make. 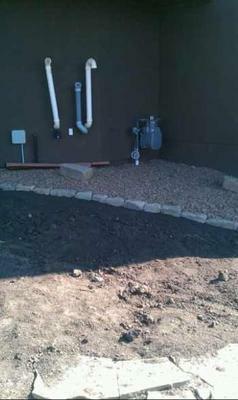 have added like irrigation, electrical lines for lighting, or other outdoor features. What about some of the other things we never consider like a high water table? There are also unforeseen objects during excavation that can pop up at any time like buried stumps, rocks, wood, steel, concrete, and bodies (we hope not). So there are probably about 10,000 examples of poor planning that we could use for an example, but I am going to give one that frequently gets missed. Its also the very first thing we mentioned when we gave examples for “Up above”. The sun can play a huge factor in how we design. I can't begin to tell you how many times I was called for small jobs where people complain the grass won't grow. These are usually areas that nobody will see or use. (Like between closely built houses). The request is very common and this is the question I get along with it. How much would it cost to put down some landscape fabric and rock? My attached pictures were taken in the late afternoon and early evening from the north side of the house. We know that it barely receives any sunlight at all. The landscape plan drawn up for the owner was calling for lawn here. 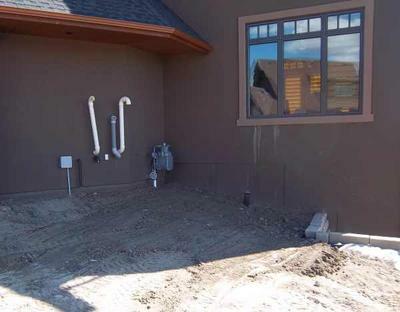 You may also notice certain utilities in this corner like a natural gas inlet, sump pump outlet, and a few others. After consulting with the customer, they decided to eliminate any maintenance in this corner. They did not want to have any awkward mowing areas, and the grass stood little chance of surviving. We also ran a 30 ft. Underground extension on the sump pump outlet to a better place in the yard. There were other options, but as a landscape consultant on this job I try to point out the options and let the customer decide on what they want to do. Simple project, simple fix, no maintenance. So that's it for my little trick of the trade. It really isn't that little though. Remember these three words when planning. Up, down, and underground. They can save you a lot of time and money.